On Tuesday, 16th of March, Ihar Mahaniok sent an invitation to mapmaker-belarus google group to come to Google Mapping Party in Minsk on 19th of March. OSM BY team looked into this invitation, and finally an idea was thrown on IRC-channel: let's go and tell them about OSM! A group of volounteers (Komzpa, timerov, andrewsh, Haryaalcar) started preparation process. Hind, a cat from Moscow, helped us with T-Shirts designs. Various other people, including Blackadder, helped me with my presentation. Thus, on March 19th 18:00 our group entered the GMM-MP room. What did we see? A lot of computers with old 17" CRT displays, with Chrome opened. The whole envionment seemed to be made to limit people's ability to communicate and socialize - "sit straight and map". After listening to wonderful Ekaterina's speech ("that's cool! let's change teh world! you map, we show!") Ihar gave a master-class on using mapmaker. After showing how to add a POI to misplaced building of place the event was held (wordplay: IT&telecom centre - Центр Информационных Ресурсов и Коммуникаций - ЦИРК - circus) (compare: http://tools.geofabrik.de/mc/?mt0=mapnik&mt1=googlemapmaker&lon=27.55132&lat=53.90163&zoom=18) and showing how to edit other cities (my beloved Cherven: http://tools.geofabrik.de/mc/?mt0=mapnik&mt1=googlemapmaker&lon=28.40447&lat=53.71553&zoom=13), where no hirez data was available (unfortunately ;), he said the keyword "Questions?". Timerov started in an interesting way: "Can some more about what mapping party is be told?". Ihar answered, that mapping party is the event when google mapmakers go to place with computers and broadband internet. "Can we add a bit about the history of mapping parties?" - "What?" - "May we show it on projector?" - "Yes, if not long". My turn. Go to their projector, download my PDF, open it. Start from 2006, Isle of Wight. No interested faces. Barbecue... hey, really changed audience! 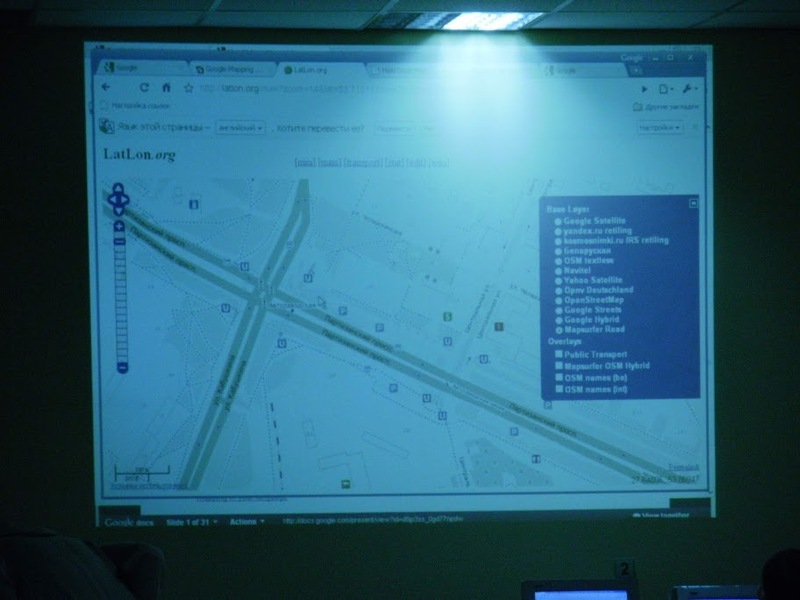 Traces and photos from previous micro-mapping-parties in Minsk... Google guys change in face, and I start to strip-tease, showing my OSM t-shirt :) Photogrammetry finishes my presentation. Lots of questions. "Where? How? Who? Why?..". Answered. Continue questions to GMM. "How can we use them in GPS?" - "Afaik, no way of doing this". Google Maps Belarus was not started officially. That's what Mahaniok said. Seems some mapmaker guys thought I work for google. They asked me questions about GMM! I was carefully showing them how to do that on OSM. Speaking to others was hard. "We're not mappers, we're just students" - a number of people was gained not because they liked mapmaker or accepted invitation, but just because their teachers told them to come. I remind, everything's held in Belarusian State University. Me: "Ihar, how can I map some grass?" - "Isn't it in types?" - "It's not" - "Can't be! Look a bit more!". Then he scrolled the list for a minute and finally answered: "Unfortunately you can't add grass to mapmaker for now." After all, they gave everyone a mapmaker t-shirt and invited to a group photo. OSM Team was in OSM black ones (Thanks Hind! ), mapmakers - in blue. Then they gave everyone diplomas (yeah, I'm trined mapmaker with 3 edits there!) and special ones to most successful moderators, me ("to the mos socializin guy here") and andrewsh ("the guy who asked most of the questions" ;) Special diplomas had 4gb pqi USB Flashes as attachments. In the same manner Ihar gave me a diploma I gave him a leaflet. "Thanks, but I know everything about OSM" - "then pass it to Google! :)" - "They know that too.." - "Why starting mapmaker then?" - "It's a sore subject". Finally, while leaving (OSM Team was one of the last), we were given 3 pizzas and 5 bottles of water - "anyway we don't know what to do with it". So we went to the park, ate it all, and returned home, making photos of everything we've seen. Gotta map! PS: Thanks google for a really nice day and for attracting people's attention to map-making topic! Ребята, вы жжоте. Жаль не увидел этого. Я, кстати, в Украине тоже выступал на мероприятии про Google Map Maker. Excellent guys ! Going to a GMM mapping party to show and explain OSM, that's "having cojones" ! Muahaha! Fantastic idea! Can't stop laughing about this. Great idea and implementation guys! Haha. Looks like a lot of fun! An example for us all, Google have been much better at advertising GMM, which lacks coverage, both in area and tags, so enlightening people about the better alternative in a friendly manner is probably both good for relations with other projects, recruiting more mappers, and not to mention allowing for more products to use our map. I will for sure try to do something similar of I ever end up at a GMM information camp.